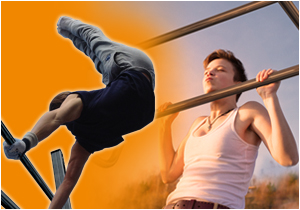 Street Workout is an urban sport, midway between muscle building and gymnastics. It consists in a series of strength, suppleness and balance exercises. These exercises are done using only one’s bodyweight, on several sets of bars installed at different heights. With this equipment, you can perform pull-ups, dips, push-ups, squats… which will helps you gain muscle strength, endurance, and suppleness. Street Workout is a complete sport which is usually done as a group activity. It’s also a state of mind which brings together discipline and a sense of sharing and mutual assistance, to bring out the best in everyone.